Stained concrete floors are becoming increasingly more popular in commercial, industrial, and residential projects because of the variety of benefits and advantages that these floors offer. From initial cost savings to lasting durability and low maintenance, stained concrete floors are an ideal choice in nearly any building or renovation project. Additionally, stained concrete floors can incorporate a number of decorative applications and elements in order to increase the look and aesthetic appeal of this flooring. Durability: One of the best qualities of stained concrete flooring is its durability and resistance to wear and tear. Stained concrete floors offer all of the durability of concrete flooring including high compressive strengths. They will also not warp, buckle, or flake like some other flooring options. Additionally, stained concrete floors are ultraviolet light resistant to resist fading or discoloration. Finally, unlike some concrete paints, concrete stain will not chip or peel. Beauty: Properly designed and installed concrete flooring is capable of capturing the look of far more expensive flooring options including granite, marble, travertine, sandstone, flagstone, and slate. This can give your flooring an elegant and stylish look at an affordable cost. Even single color concrete floors can provide a unique look, allowing them to stand out beyond any commercial or industrial application. Energy Savings: Concrete floors have an ability to absorb, store, and slowly release heat and coolness. Because of this “thermal mass” property, exposed concrete floors, such as stained concrete floors, can reduce the load on heating and air conditioning equipment by moderating indoor temperature swings while outdoor temperatures may vary drastically. Low Maintenance: Stained concrete floors require very little maintenance compared to other flooring options. These floors can simply be swept and mopped clean as needed while maintaining their overall look and elegance. Occasionally, stained concrete floors in high traffic areas may need to be buffed or repolished to maintain their shine. Optimal Indoor Air Quality: The four main sources of indoor air quality are (1) allergens, such as dust mites, mold, mildew; (2) retained moisture and dampness; (3) odors from smoke and cleaning agents; and (4) volatile organic compounds (VOC’s) emitted from some building materials. Stained concrete floors eliminate all of these indoor air quality problems because they do not allow for the growth of mold and mildew, will not collect dust mites, easily allow moisture to evaporate, can be cleaned easily without harsh chemicals, and can be installed with a sealer that contains low or no VOC’s. Water Resistance: Stained concrete floors allow low amounts of moisture to pass through without leaving behind any negative results or effects. Stained concrete floors will not warp or rot, grow mold or mildew, or discolor like many other flooring surfaces when exposed to moisture from above or below. At Advanced Environmental Services, we offer concrete stain application services for commercial and industrial clients. 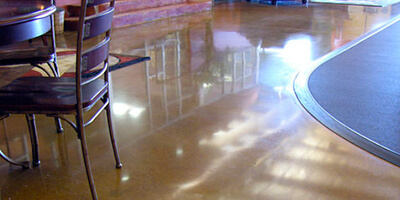 We can apply durable concrete stain coatings to nearly any new or old concrete surface. Our stained concrete flooring application services include the use of a variety of stains and colors in order to create the elegant or stylish look you desire. To learn more about how our concrete stain application services can create stylish and beautiful floors for your commercial or industrial building, please feel free to contact us at Advanced Environmental Services to speak with one of our flooring experts.